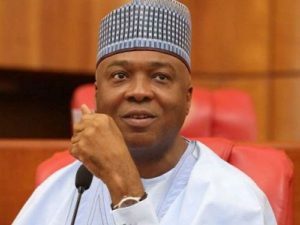 The national leadership of the Peoples Democratic Party has sent the name of the President of the Senate, Senator Bukola Saraki, to the Independent National Electoral Commission as a senatorial candidate. The name of Saraki was among the list of candidates submitted to the commission in Abuja on Thursday night. Saraki, who represents Kwara Central District in the Senate, was among the 13 presidential aspirants of the party. He came third at the party’s national convention which was held in Port Harcourt, Rivers State. The PDP had held the senatorial primaries before that of the presidential primary. While Saraki paid for the PDP nomination and expression of interest forms, it was however not clear if he paid for that of the Senate as well. Investigations by one of our correspondents in Abuja showed that Saraki’s name was used to replace the name of one Ope, whose name was initially filed as the PDP candidate for the senatorial district. It had initially been speculated that the former governor of Kwara State was among the suspected presidential aspirants in the party who had another plan since they knew they could lose the PDP presidential nomination. It was learnt that Saraki is being positioned to return as the President of the Senate in 2019 by the PDP, if former Vice President Atiku Abubakar wins the presidential election. Meanwhile, the tension among the All Progressives Congress aspirants heightened on Thursday as members who aspired for governorship and National Assembly seats inundated the party’s Director of Organization, Altai Abu-Bakr Kari, with calls in a bid to know their fate. Kari, who led some party officials in an APC branded coaster bus held tightly to a bunch of files on one hand and struggled to answer calls to his mobile phone with the other. It was gathered that aspirants for national assembly seats were especially eager to find out the outcome of their petitions to the Prof. Osariemen Osumbor-led APC Governorship and National Assembly Appeals Committee. This was against the backdrop of the party’s last minute effort to beat the 12:00 midnight deadline set by INEC for the submission of the list of all party candidates for the 2019 elections. A summary of the panel report document obtained by one of our correspondents in Abuja, on Thursday, indicated that all petitions against the Senate and House of Representatives primaries were rejected. In Delta State for example, eight petitions were upheld by the committee which agreed with the petitioners who argued that they won the primaries but that their names were surreptitiously replaced. Seven petitions were rejected for lacking merit. In the South-West zone, six petitions were received and treated by the panel from Ekiti State. The petitioners faulted the conduct of the National Assembly primary held in the state but their petitions were thrown out. A similar fate befell three petitions filed against the conduct of the House of Representatives primary in Osun State. In Ondo State, the panel upheld three petitions for Senate, referred one to the National Working Committee; rejected two and upheld the five petitions for the House of Representatives. The five argued successfully with documentary evidence that they won the primary but their names were substituted. Of the two petitions received from Lagos, one was rejected for the Senate, while the one for the House of Representatives was upheld. The panel also rejected two senatorial petitions from Ogun State and recommended that the third petitioner be adopted as the candidate, saying stakeholders of the party in the areas agreed to adopt him as a sole candidate. The Osunbor-led APC panel equally upheld the disqualifications of some of the party’s aspirants by the Adams Oshiomhole-led NWC and its decision to grant automatic tickets to serving governors and some lawmakers. Some of the prominent members disqualified are a former Inspector-General of Police, Suleiman Abba, and the Political Adviser to the Kaduna State governor, Mallam Uba Sani. From the panel’s report and recommendations, it became obvious that pressure mounted by some state governors, especially the Kaduna State Governor, El-Rufai, as well as the wife of the President, Aisha Buhari, did nothing to influence the committee. In the North-West, the panel upheld the automatic ticket given to Senator Shehu Sani (APC, Kaduna Central), after rejecting petitions filed by Senator Mohammed Saleh, Usman Ibrahim and Samsuddeen Giwa challenging the decision of the APC NWC to disqualify them from contesting the primary. It also threw out a petition by Dr Abba Ibrahim who cited irregularities in the party’s decision to grant Sani an automatic ticket. For Kaduna North, the APC panel threw out the petition filed by Senator Aliyu Lawal who also complained about alleged irregularities in the conduct of the primary in the area. A petition filed by Ahmed Munir, who contested the Lere Federal Constituency in the House of Representatives, asking the panel to declare him as candidate was upheld. Munir had petitioned the panel alleging that the aspirant who won the contest was indicted by a court of competent jurisdiction for an unspecified offence in 2008. The panel found merit in his petition and declared the petitioner as the party’s candidate. A petition filed by Ahmed Shuiabu Adda’u who contested the party’s ticket for the Makarfi/Kudan Federal Constituency challenging his alleged wrongful disqualification, was thrown out for lacking merit. Another aspirant, Rufai Chanchangi, who contested the Kaduna South Federal Constituency, petitioned the panel, citing irregularities but his petition was equally rejected. For the Sokoto State governorship, petitions filed by two aspirants, Senator Abubakar Gada and Faruk Yabo, citing the refusal of the APC election committee to follow guidelines for the conduct of the exercise were also rejected. Similar petitions by senatorial aspirants for Kebbi Central and Kebbi South, Aminu Shamaki and Sule Sami respectively, were also dismissed. The panel also dismissed a petition filed by Abdullahi Sura who contested the Sum/Bagudo Federal Constituency in the House of Representatives. It, however, referred a petition by Abdullahi Faruk , the member representing Birnin Kebbi/ Kalgo/ Bunza Federal Constituency in the House of Representatives, whose petition was a “Plea for fulfilment of promise of automatic ticket for loyalty to the party,” to the APC NWC. In Jigawa State, the panel dismissed petitions filed by Hashiru Yusuf and Allhaji Hashimu against the conduct of the governorship primary on the grounds that the petitions had been overtaken by INEC’s guidelines for the conduct of fresh primaries. Former IGP, Suleiman Abba, who petitioned the panel to protest the removal of his name from the ballot in the contest for the party’s ticket for Jigawa South Senatorial district also failed to gain the panel’s sympathy. The case of Abdullahi Gumel, a sitting senator who lost the primary was referred to the NWC for further action after he petitioned the panel, citing irregularities in the conduct of the primary which he lost. In Kano, the case of the Special Assistant to the President on National Assembly Matters (House of Representatives), Suleiman Kawu-Sumaila, was also referred to the NWC for further action. Similar cases referred to the NWC included those involving Suleiman Halilu, Laila Buhari and Senator Isa Zarewa who contested the Kano Central Senatorial ticket. Petitions against the conduct of the governorship primary in Katsina State were also referred to the NWC. The two petitioners were Alhaji Garba Sani and Abubakar Isa. The panel also dismissed petitions by a senatorial aspirant for Bayelsa Central, Barry Indutimi. It also dismissed appeals by Mr John Odey, Chief Edem Duke and Chief Eyo Nyong, who demanded a fresh governorship primary in Cross River State. The panel also held that the petition filed by Prof. Pat Utomi challenging the validity of the governorship primary in Delta State had been overtaken by events. It, however, upheld an appeal by Halims Agoda who won the primary for Ethiope Federal Constituency but had his name replaced. For Rivers State, the appeals by Senator Magnus Abe and Chief Dumo-Lulu Briggs against the conduct of the governorship primaries were rejected. For Akwa Ibom State, appeals by Bassey Dan-Abia, Senator James Udo-Udehe and Dr Edet Efefuei against the conduct of the governorship primary were similarly thrown out. It, however, upheld the appeal by Robinson Uwak who won the primary for Oron Federal constituency but was denied victory. Similar petitions by Iquo Inyang and Mrs. Glory Ekpo who contested and won the primaries held for Ikono/Ini and Etinam Federal Constituencies were also upheld. The party’s primaries held across the country were marred by allegations of irregularities and disqualification of aspirants. Several of these issues led to a series of meetings between the party leadership, some aggrieved governors and President Muhammadu Buhari. The president’s wife who felt slighted by the party for failing to support the emergence of her brother, Mahmoud Halilu, as governorship candidate in her native Adamawa State, took to her twitter handle to register her displeasure. However, aspirants whose petitions were not treated voiced their opposition to the panel’s handling of their petitions. One of such aspirants, Mr Adaze Wilson Imafidon, who was seeking the party’s ticket to contest the Orhionmwon/Uhunmwonde House of Representatives Federal Constituency seat, submitted a petition to the appeals committee through his lawyers, describing the purported primary election held in the constituency as a sham. Party supporters from Benue State, under the aegis of Benue South APC Justice and Equality Movement, protested to the party headquarters, on Thursday, asking the NWC to caution the Minister of Agriculture, Chief Audu Ogbeh, for allegedly substituting the names of elected candidates with those who did not participate at the primary. The coordinator of the group, Mr Akor Ikwuocha, told newsmen that they were surprised that after the emergence of a winner from the party primaries and names submitted to the approximate authorities by the electoral committee, “the minister allegedly called a meeting of a few persons while overseas and announced that he was substituting names of most of the candidates because they were not his choice. The protesters said the attempt to change the names of elected candidates across Benue South may put the APC at a serious disadvantage in the zone. The protesters appealed to the NWC to caution the Minister and ensure that all those candidates that won the primary elections are allowed to go for the general election as party’s candidates.